If you know me or have been reading my stuff for more than 5 minutes you know that I have no secrets. My life is an open book. But I did have one secret. One little thing in my life that I never talked about much. It wasn’t a real secret because I would have talked about it to anyone but I never did much… until my daughter’s wedding in LA last week that it. Now that the secret is out… I might as well write about it for those that did not attend my daughter’s wedding in LA on September 7th. I have a few loves in my life outside of my family. I love writing. I love teaching. I have some special interests like photography, things I really like but have no time for in my schedule. One of these special interests is flowers. I have enjoyed flowers for as long as I can remember and my best friends in the world have no idea how much I enjoy them. My own children have no idea how much I like flowers, mostly because my wife thinks fresh flowers are a waste of money and I have never had a garden… but that changed a few months ago when my daughter said that she couldn’t afford the flowers for her wedding. Truth be told, she could have afforded the US$3000 but it would have cut into her wedding or honeymoon. 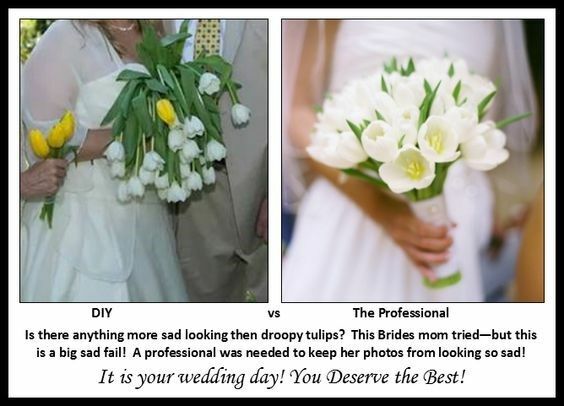 I think she was hoping that I would pay for them but I had another idea… so I offered to do the flowers for her wedding. Right now I would like to thank my daughter Chantell and her new husband Matt for trusting this to me. Neither had any idea how much I wanted to do the flowers nor how serious I would take the task… and none of us knew how it would turn out. I have one of those ego-centrical personalities that makes me believe that I can accomplish anything I set my mind to but let’s be honest… I had never made a wedding bouquet. I had never made a boutineer. 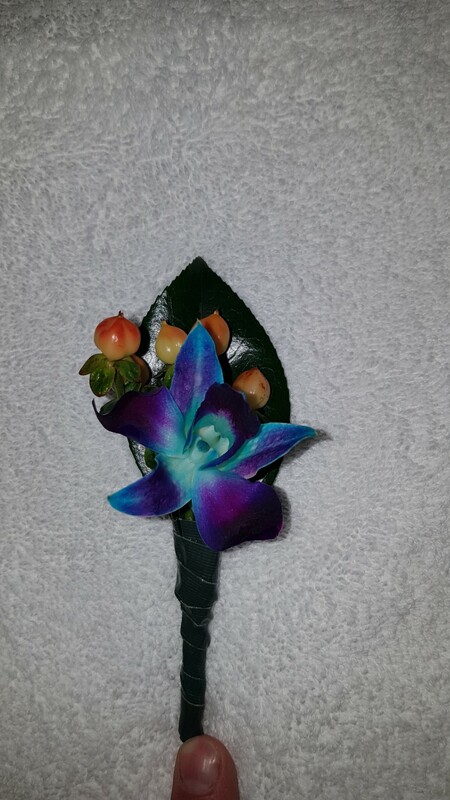 I had never made a corsage. I wasn’t even sure what flowers you needed for a wedding but Chantell had a list from the florist she talked to in LA and I took it and hit the internet. I knew that I could accomplish the task at hand but I was expecting some heavy lifting for my first time out. I bought the flowers with a plan to do some test-runs and create some pretty funny “Nailed It” pictures but when we ended up buying the flowers I suddenly realized that time would not allow for the experimentation I thought would be required. Not anything I did, but I thought this might be where we started. Chantell wanted something classical and I watched so many videos and read so many blog posts and learned so much that I was ready… or so I thought. I was ready with roses. I was ready with mums, carnations, and daisies. I even got caught up in lessons about funeral arrangements and looked forward to the possibilities of working with tulips and lilies. And she really wanted birds of paradise. I thought this would blow my budget because these orange beauties were $15 a flower back home. 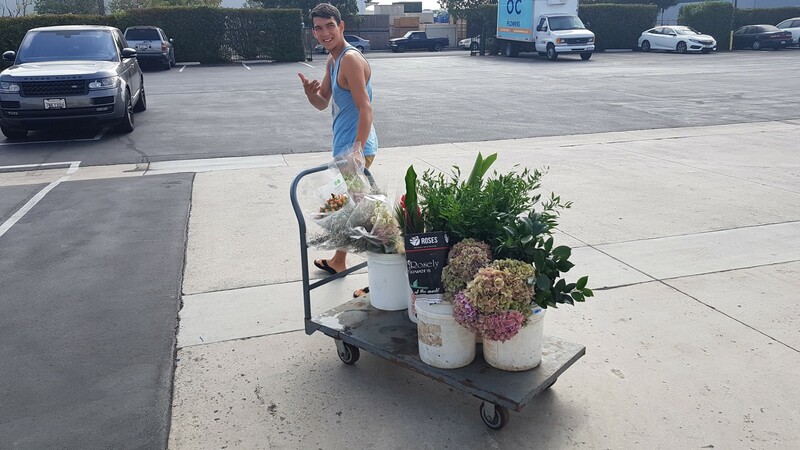 Then, after dozens of hours of training, we arrived in Anaheim and I took Chantell, Matt, Ryan, and Helen to buy some flowers. We had to find pink or peach and teal flowers. My daughter brought me this beautiful bouquet of wild flowers… “I kinda want this for a look”. I looked at her and smiled and told her that this was the opposite of the classical bouquet we had been discussing and she informed me that she loved them both. Wonderful. Chantell walks around for 30 minutes and decides that she also wants Hydrangeas and Orchids. All I knew about hydrangeas was that they didn’t get all their water through the stem, but through their petals. In order to work with them, I would need to submerge them in a bathtub of cool water for up to 4 hours. I also knew that my hotel room, while having a pretty cool shower, did not have a bathtub for US$200 per night. I also knew that hydrangeas, if not watered, wilt faster than almost every other flower and that they bruise and damage extremely easy. 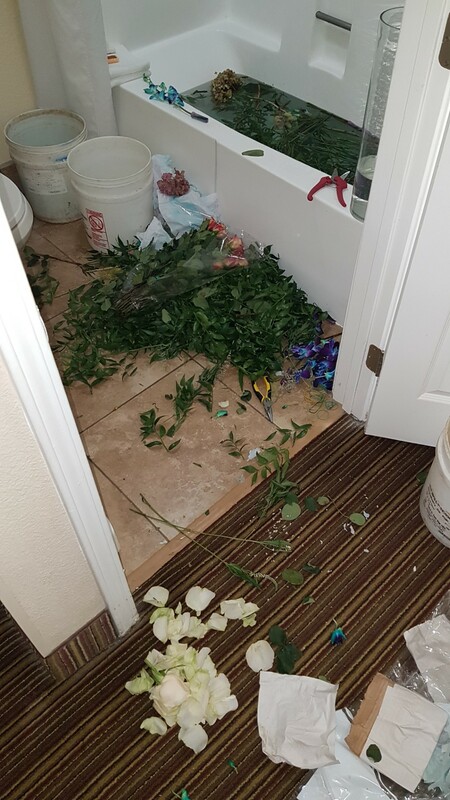 The only flower I could think of that was more susceptible to damage was an orchid. This is getting exciting. It was lunch time now and I needed to get five 5-gallon pails of flowers into water, some upside down. And I needed to work fast to figure out what to do with a six foot box or orchids before they started to wilt. 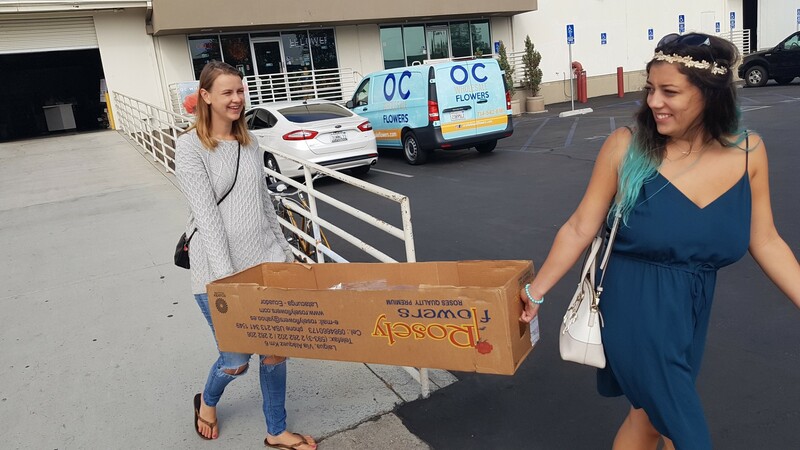 Helen and Chantell carrying 12 dozen orchids to the van in 28C heat… that is 82F for my American friends. I was looking at some of the great video tutorial teachers I had saved to see if any of them had any great videos on how to use orchids in corsages and one of them had a singular piece of advice… choose another flower. It did not instill a lot of confidence. 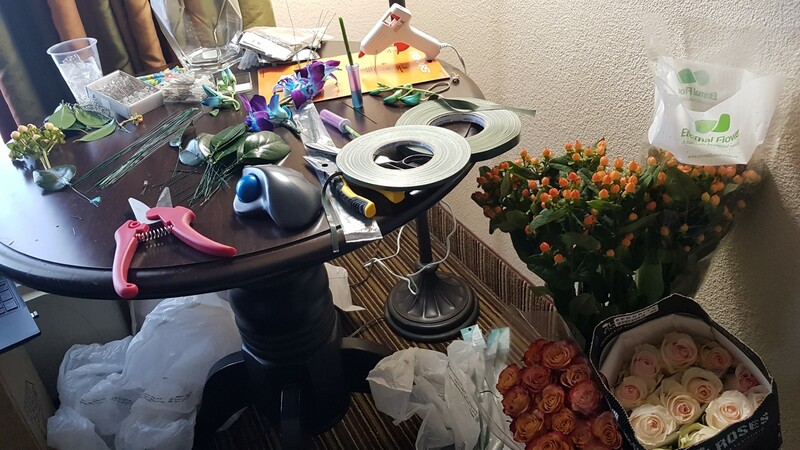 It took an hour to buy the rest of the supplies that I needed but thanks to some amazing people at the florist, we made quick work and saved maybe US$200 on supplies and materials to make the wedding happen and even found some amazing vases for the ceremony. Vases anyone? 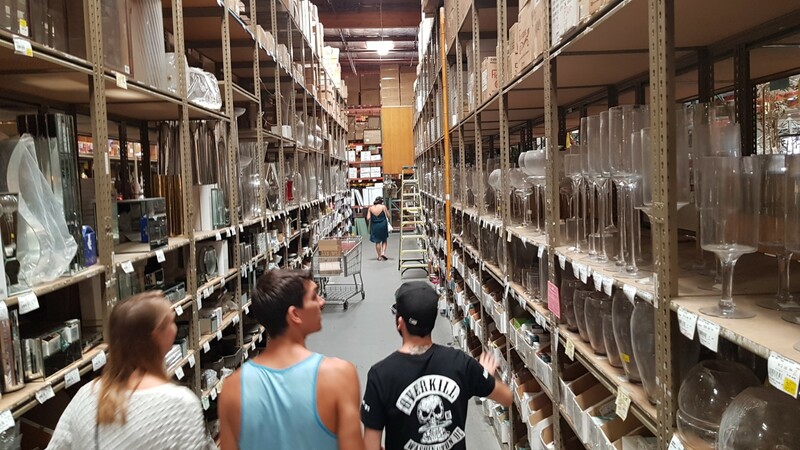 This was a warehouse supplier for stores like Michael’s and they had everything I could have ever dreamed of. I got back to the hotel, quickly convinced my mother to let me take over her hotel room as floral-central and got to work trying to figure out how to work with the orchids. It took me 2.5 hours to build my first boutineer but it looked good. So good that I wasn’t sure that my “Nailed It” picture was going to work at all. I went to the pool with the kids for a couple hours and went to cook supper for my family and friends at the RV park and at 11pm I headed back to floral central (my mother’s hotel room) and got busy building. Nine hours later I was done the base builds and just needed to make bows and wraps and fill vases… and clean up. Yes, it meant another sleepless night but the results were amazing. And when you are truly doing something that you enjoy that much, sleep is not such a stringent requirement. So here are a bunch of pics with the end results of what my daughter ended up with for her wedding. My total cost was under US$800. 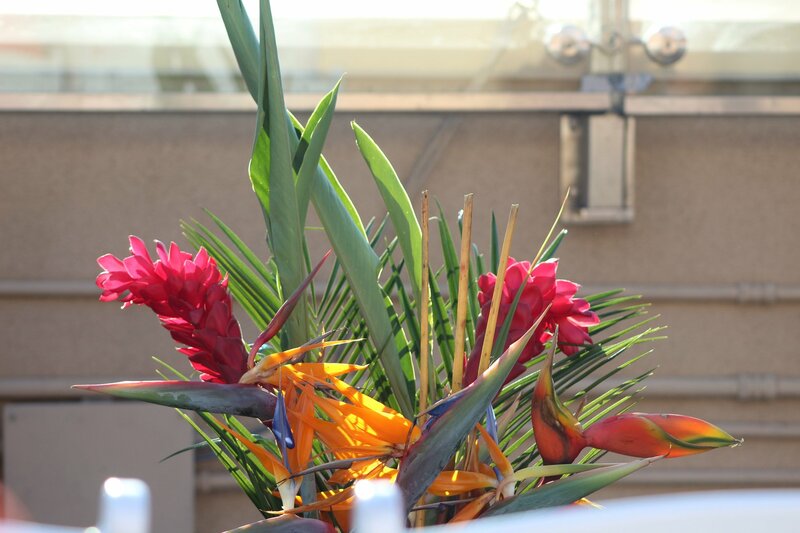 There was the one problem with the Birds of Paradise because the florist I talked to said they don’t sell many because they grow like weeds down there… so we had to prune some plants from a road near Disneyland in order to acquire a dozen of these spectacular flowers. Although this was probably frowned upon, and likely illegal, it was necessary and we did it with great care not to overly damage any single plant or affect the beauty of the street they were adorning. I took over my mother’s hotel room as floral central for the wedding… I owe her big time for that night. I do not have a ton of photos yet of the actual wedding mostly because this is the first one I have ever been to where I didn’t take a single picture. Weird eh? So there you go… kinda classical… kinda wild… totally beautiful. The flowers too. Yeah, baking is not my passion either. Mostly I’ve graduated to sous chef, or assistant baker as my daughters have taken up the torch, and when I can, I sample the results. They have the passion. I give you so much credit for busting out your secret, and wow! did the flowers turn out well! Awesome undertaking! We are regularly involved in events, but usually on the baking/decore end, and I would be so intimidated to try flowers. This is such a great memory-maker! Way to go, Dad! Now had I tried to bake or decorate a cake we would have definitely gotten some awesome “Nailed It” shots! I love baking but mostly because i like eating baked goods… not sure I would call it a passion.